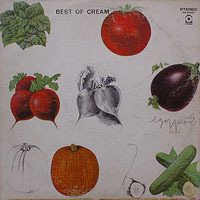 T hat their record companies (Atlantic and Polydor) released Best of Cream just as Blind Faith was issuing their first (and only) album speaks to the popularity of Cream following their break-up. (Blind Faith topped the UK and US charts, and Best of Cream fared nearly as well, reaching #3 in the US and #6 in the UK -- not bad considering that Goodbye had hit #1 in the UK and #2 in the US a few months earlier.) While the album cover, featuring sketches and paintings of vegetables, may be beyond mere mortal comprehension (for a great band they really had ugly album covers), the music within is outstanding and essential. The selections made are unimpeachable, if weighted toward the generally superior Disraeli Gears and Wheels of Fire, which account for six of the ten tracks here. The menacing “Born Under a Bad Sign” is selected from their first album, while “Badge” appears from their last. At the time of its release, Best of Cream also included two singles previously unavailable on any album: the band’s searing rendition of Willie Dixon’s “Spoonful” and “I Feel Free” (although the decision to end the album with the latter closes the collection on a weak note). 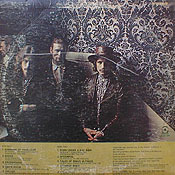 Subsequent compilations (beginning with 1972’s Heavy Cream) have rendered Best of Cream redundant, building on its base of ten by adding more tracks. As a result, this album has not been reissued on compact disc, although a 1977 reissue on the R.S.O. label appears to exist in elpee and cassette form.